So, this time an unusal combination with Olive Oil and Rosemary. And how did it turn out? Well, the truth is that I didn't expect so much of it, but the result was absolutely great! It smelled so good of olive oil and rosemary, and the taste was quite "fresh and herbal". I am definetely going to repeat this one! Así que, esta vez, como decía, una combinación poco habitual con aceite de oliva y romero. ¿Y cómo creéis que salió? Yo no tenía unas expectativas muy elevadas, ¡pero el resultado fue fabuloso! Tenía un delicioso aroma a aceite de oliva y romero, y el sabor era «refrescante y herbal». ¡Una receta para repetir! ¡Espero que os guste la receta! ¡Y, por supuesto, todas las deliciosas recetas del talentoso grupo de Bundt Bakeres, aquí debajo! :-) Gracias, June, por el tema tan original, me ha encantado! I hope you enjoy the recipe! And of course, all the delicious recipes of the talented group of Bundt Bakers here below! :-) And thanks, June, for the original theme, I really enjoyed it!! Precalienta el horno a 175℃ y engrasa un molde de bundt cake con espray para hornear o con aceite. Preheat the oven at 175℃. Grease the inside of a 10 cup Bundt pan. Mezcla bien la harina, la harina de maíz, la levadura química y la sal en un cuenco mediano. Whisk the flour, cornmeal, baking powder and salt in a medium bowl until thoroughly combined. En el cuenco del robot de cocina bate la mantequilla con el azúcar a velocidad media unos 2-3 minutos hasta que obtengas una crema ligera y suave. Añade el extracto de vainilla y el zumo de limón y bate medio minuto más. Añade los huevos, de uno en uno, batiendo bien después de cada uno. Por último añade las yemas de huevo y bate hasta que todo quede bien incorporado. Con el robot a velocidad baja añade el aceite de oliva y bate hasta que quede una mezcla bien homogénea. Añade la mezcla de harina y el romero y mezcla lo justo hasta que quede incorporado. ¡No mezcles más de lo necesario! In the bowl of a standing mixer fitted with the paddle attachment, beat the butter with the sugar on medium speed for 2 to 3 minutes, until light and fluffy. Add the vanilla extrac and lemon juice. Add the eggs, one at a time, beating well after each addition until incorporated, then beat in the egg yolks, one at a time. With the mixer on low, slowly add the olive oil and beat until thoroughly incoporated. Add the flour mixture and the rosemary and beat until just incorporated- do-not overmix! Pour the batter into the prepared pan, smooth the top, and bake for about 40-50 minutes, until a cake tester inserted in the center comes out clean. Let the cake cool in the pan on a wire rack for about 20 minutes, the invert the cake onto the rack and let it cool for about 30 minutes more. Drizzle the warm cake very lightly with olive oil, then sprinkle it with a little sugar. Serve warm or at room temperature. The cake will keep in an airtight container at room temperature for up to 2 days. 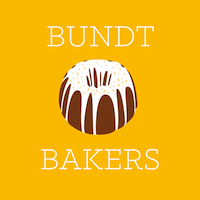 See you again next month in the Bundt Bakers! ¡Nos vemos de nuevo el mes que viene! I so envious of you having your own olive trees and olive oil. How fantastic! Nice cake to make with it too. Thanks Renee! Yes, for me to it's quite special (I am Dutch) and I love living here :-))) See you again next month! olive trees in your backyard, fantabulous!! Bundt looks plump and cute. Beautiful flavors!! Thanks Priya :-) Yes, absolutely fantastic having your own olive trees in the garden :-) See you next month! Wonderful! I'd put olive oil in everything if I had my own trees. What a lovely cake. Olive oil cake is my favorite kind of cake. Love the idea of pairing rosemary with it. Rosemary is so so good in desserts. Thanks Ansh! For me it was the first time I made a olive oil cake :-) And yes, I loved it! Muchas gracias Bea y Mara! Es verdad, da mucho gusto pasear así con los perros :-))) Besos guapas! Holy cow! I'm so jealous you have your own olive trees! So cool! This cake is simply gorgeous and I'm truly in awe! I thought of doing an olive oil cake with lavender when I was first mulling over ideas for this month, but I'm glad I didn't because your cake would have out-shined mine! Really? You have your own olive trees? I am so jealous of you Lara! nevertheless, I loved this flavor combination and I want to try this cake ASAP. Thanks June! See you again next month! What a treat to have your own olive oil!! I adore the fragrant aroma of rosemary - they work so well together. YUMMMM! You get to make your own olive oil?? How lucky is that?! Rosemary was a common ingredient for our group this month. I chose it as well. I love that you paired yours with your homemade olive oil. Thanks Wendy! We have our own olive trees, pick them and then bring them to a cooperation who makes oil of them. We don' have our own press to do it (is really expensive and we have "only" about 10 trees ;-) ). See you again next month! What a coincidence that I am the group member who made the chocolate beet, but I almost made olive oil and rosemary. I will have to try this soon. I love the book you made this from, I've yet to try this recipe but I think I will in the warmer months. Pretty cool that you have your own olive trees! And your cake does look delicious! This sounds delicious! I am so jealous of your own olive trees! That's amazing. Yummy cake.